For over a decade now, Richland College of Dallas, Texas, has maintained the distinction of being the nation’s first and only community college to earn a Baldrige Award. Now part of the Dallas County Community College District, the organization continues to drive improvement and innovation and deliver excellence using the Baldrige Excellence Framework (which includes the Education Criteria for Performance Excellence). In recent years, Richland College was named an “Achieving the Dream Leader College” by Achieving the Dream, Inc., a nonprofit, non-governmental reform network promoting the success of U.S. community college students. The national designation is awarded to U.S. community colleges that demonstrate they are committed to and show evidence of improving student success and closing achievement gaps among students of different races. At the Baldrige Program’s Quest for Excellence® Conference next month, Fonda Vera (Richland College’s associate vice president of planning, research, effectiveness, and development) and Bao Huynh (the college’s director of institutional effectiveness) will present a primer on designing an institutional measurement system. Vera and Huynh have presented before on this important topic, addressing considerations such as how to choose the best measures, what those measures tell you about the organization’s performance, and next steps after selecting measures and tracking data for them. Vera recently shared the following information and guidance for other organizations in response to my questions. How has systematic performance measurement been important to your institution in recent years? Systematic performance measurement has been critical to Richland College as we have faced declining state reimbursements coupled with the highest enrollments in the history of the college. Systematic measures that align with the college’s mission, vision, and values have allowed our senior leadership to make data-informed decisions regarding allocation of resources, keeping Richland College effective and efficient without compromising quality. At a recent conference presentation, one attendee asked me how we get employees to “buy in” to this “initiative.” This question highlighted that for [my organization] performance measurement isn’t an initiative but, rather, how we operate: it is ingrained in our culture. What are your top tips for creating a strong measurement system across an organization like yours? Begin with your mission, vision, and values in mind. Be sure to measure what you value. Identify key performance indicators and measures that will yield actionable data (i.e. why are you measuring this?). Be sure you are selecting important measures. Just because you can measure something doesn’t make it important. Commit to your measurement system for a year; then evaluate and revise as appropriate. Use your results to create the next iteration of your strategic plan. What else will participants learn at your upcoming Quest session? 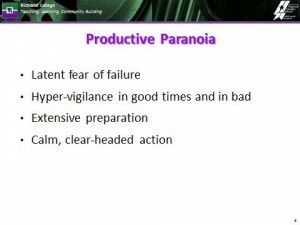 Session participants will learn the value of discipline and the concept of “productive paranoia” in a measurement system. Using these concepts has proven to be powerful for Richland College in terms of gaining and keeping a competitive edge in the highly competitive Dallas–Fort Worth area’s higher-education market. What are the key reasons why or ways that other post-secondary education organizations today can benefit from using the Baldrige framework? Using the Baldrige Excellence Framework (Education) helps keep organizations agile and attuned to changes in the environment that may have an impact on student enrollment and, ultimately, success. Generally, colleges that follow the Baldrige Education Criteria will remain ahead of the curve through continuous improvement and innovation. For more information, attend the community college’s presentation on Tuesday, April 5, at the Baldrige Program’s Quest for Excellence® Conference in Baltimore, Maryland.